Ten half-ton bulls charged down the winding colonial streets of the small Mexican town of Tlacotalpan, kicking at screaming spectators in a chaotic version of Spain's famous "Running of the Bulls." The tradition, enacted in a handful of Mexican towns, traces its roots back to the centuries-old Pamplona bull-run in Mexico's former colonial power. But unlike Pamplona, where a pack of bulls chases people for a few minutes down a carefully cordoned-off path, in Tlacotalpan the beasts are let loose to rampage through the streets for hours as crowds taunt them. The town, which draws its name from an Aztec word meaning "land between waters," lies on the banks of a river where the bulls are lashed to the side of row boats and forced to swim across before being released wet and exhausted. "The bulls are angry when they arrive, obviously, so they go at it with full force," said Cristobal Salamanca who studies local traditions. Men on horseback rope the animals and steer them near raucous crowds clad in bright red T-shirts, many chugging beer under the hot sun. The dangers increase after hours of drinking sweet creamy cocktails called "toritos" ("little bulls") made with local moonshine, sugar, milk and fruit or peanut flavoring. On one narrow street, four men drove an angry bull toward bystanders who fell over in panic. A teenage girl was butted and suffered a dislocated jaw. After hours of chaos, the bulls are rounded up and let out to pasture. The bull run is part of a week-long religious celebration during which all-night parties echo with foot-stomping local music. The climax is a boat parade down the river of a statue of the Virgin Mary clad in golden robes. Animal rights activists have tried to shut down the event, saying the bulls are terrified by firecrackers, police sirens and shouting people, many throwing bricks, bottles and cans, slapping them or pulling their tails and legs. Last year two dozen people were hurt, including an elderly man who was airlifted to the hospital after being gored. "People cut off their ears, kick them. There is a new rule that you are not supposed to touch the bulls but after so many 'toritos' it's hard to control," resident Norma Salomon said. Critics also denounce the Pamplona bull-runs as cruel, but the fiesta -- made famous by Ernest Hemingway's novel "The Sun also Rises" -- still draws thousands of visitors. 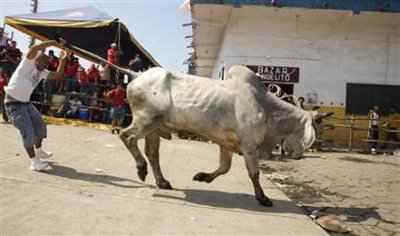 When the governor of the state of Veracruz suggested banning the Tlacotalpan bull-run, townspeople occupied local government offices for a day, Salamanca said.